They're the conversations we have by the lifts, at bus stops and over garden fences. We call it small talk - but that doesn't mean it's of little importance. In this episode we tackle another big conversational no-no - salary. See what happens when Neil tries to ask Callum some financial details. BBC Learning English Producers Kee and Sam then explain what's wrong with Neil's small talk and how he could make it better in future. I've been working at the BBC for a long time now. I've met lots of people. And I sometimes bump into them… and make small talk. They call it small talk, but that doesn't mean it's of little importance. Yeah, yeah. How's the kids? How's the family? Yeah, yeah. They're good, they're good. And you… I heard you've got a new job. How much exactly? How much do they pay you? Sorry, I've got to run. See ya. Bye bye. OK. Nice to see you. Bye. See ya. Let's see what our experts have to say about that. They seem to know each other; seem to have a little bit of knowledge of each other. Absolutely. He's obviously found out that he's changed jobs. Yeah, yeah. And he reacted really nicely to it. Yeah, absolutely. Until he decided to ask how much he's earning. Why would you not ask that question? But specifically money you make. It's just not done. No, you wouldn't ask that, would you? So, what do you think he could have done instead? Are you enjoying it? You know, like, what are your colleagues like? And I think most people will want to talk about their new job. They'll want to tell the other person about what they enjoy and what they're not enjoying. But not this guy. Money. Thanks for the tips, guys. I'll try harder next time. These are examples of the topics it's best not to ask about when you are making conversation with people you don't have a very close relationship with. They can make people feel awkward and the conversation may end suddenly! Use the information you have about someone as a place to start a conversation. You might ask how their job or college course is going. Then you could tell them something about your experience at work or college. If you know they have family, you could ask how they are and say something about your own family. British people tend to avoid discussing how much money they earn or have during small talk. And asking someone about their salary will probably make them feel very awkward and want to avoid you! Does Callum start talking about his new job? Neil tells Callum he's heard Callum has a new job. Is it successful, unsuccessful or neither successful nor unsuccessful as a topic for small talk? Callum seems in a rush to leave. Why? According to Sam, why is money not a good topic of conversation in British small talk? 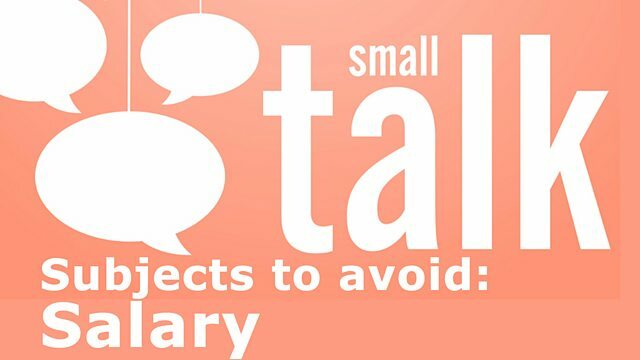 Join us in Session 12 of The Experiment for Small Talk - a short series about subjects to avoid when chatting to people you don't know very well.